Demand for financial products compliant with Sharia law allowed a number of local and western financial practitioners to create a small industry, using investment funds from the Gulf region, especially Saudi Arabia. Bahrain and Kuwait are the leaders in the region that have built comparably strong banking sector. Conventional players like Deutsche Bank, HSBC, BNP, Citi Group, UBS and Barclay’s mainly opened Islamic windows to offer Sharia-compliant products. However, penetration of Islamic banking in the financial systems remains low opening growth opportunities for new market players. Despite the fact that significant growth rates of the industry offer attractive prospects for institutions, lack of deep understanding of the main principles laying in the basis of the Sharia law and nonconformity with operational requirements; those institutions can’t take full advantage of the situation. As it was noted by analysts, success along these dimensions will distinguish the acquirers from the acquisition targets in the likely medium-term consolidation of the sector. Malaysia has developed Islamic banking since 1980’s. Malaysian central Bank was supervising conventional Malaysian banks offering Islamic financial products through “Islamic windows” over twenty years. After September 11, US authorities froze the bank accounts of several prominent Saudis, which triggered other wealthy Arabs to withdraw their funds from the United States. Ultimately, some $200 BN left the US. Many of the investors were from tiny Gulf States whose economies were too small to absorb their funds, and so they looked to Malaysia, a Muslim country with a relatively sophisticated financial system. Other countries in Southeast Asia as Indonesia, Singapore, Bangladesh, and Pakistan as well as North African countries such as Sudan and Egypt have relatively small Islamic financial sectors, which are likely to evolve as a hybrid between the Malaysian and the more conservative Arab model. A small number of boutique Islamic financial shops started in the various “stans” (especially Kazakhstan) in recent years, but there are no signs of an Islamic financial industry evolving in central Asia at this time. • “22 banks including five that are fully sharia compliant, more than in any other Western country. • 2 Islamic banks were granted licenses in 2008. • 20 Sukuk issues raising $11bn listed on London Stock Exchange, exceeded only by Dubai Nasdaq. • 7 sharia compliant exchange-traded funds (ETFs). • 20 law firms supplying services in Islamic finance. • Advisory services provided by Big Four professional service firms. • Institutions offering educational and training products in Islamic finance. Muslim population in other western countries such as the US, France and Germany represented in minor part as of between one and five million, although Russia has much the largest in Europe with 17.9 MM.Initially the Islamic finance industry was less affected by financial crisis, reporting solid portion of the profits in western banks, however it could not escape unscathed from global economic downturn. As the credit crunch hit, the market for sukuk, or Islamic bonds, took a pause in 2008, but despite recovery in issuance to $20bn during 2009, is being hit with several defaults in real estate backed instruments. One of the subsidiaries of Dubai World, Nakheel failed to repay $4bn sukuk in December 2009. Currently Dubai World which is restructuring distressed debts at Nakheel and Limitless, another developer, plans to offer creditors a restructuring proposal in March after the government last year received $20bn in bail-out loans from federal authorities, Abu Dhabi banks and the capital itself.Islamic banks seeking diversification of activities from what is mostly real estate and plain lending instruments, to offer more a comprehensive service suite including advanced treasury services, innovative asset management, balance sheet management and securitization services. “This will allow them to address the needs of underserved market segments such as Islamic financial institutions, corporates, sovereign wealth funds and private wealth clients”.1 Wholesale banking is the biggest market for Islamic finance with over $420 BN of assets and revenues of $28 BN. 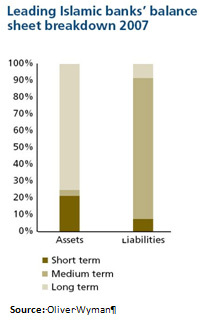 According to Oliver Wyman’s estimations wholesale assets have been growing at 34% annually and, they estimate that by 2012, total assets will reach $1 TR with revenues of more than $60 BNDue to specific capital structure, lack of expertise in structuring derivatives and asset/liability management local financial institutions can be are potential clients for larger banks that can acquire or develop the skills necessary to develop those services. Product line of those banks can be extended from pure asset liability management since Islamic principles allow bundling with project and trade finance. Moreover, there is an almost blank niche for products to manage profit margin risks and FX risks using fixed-floating profit swaps. In the high wealth individuals segment there is an unsatisfied demand for alternative investments. Relatively recent introduction of alternatives as index tracker funds, commodity funds and Islamic Hedge Funds is providing one of the biggest opportunities for asset management companies. Long term investment products are more of interest for Sovereign wealth funds (SWF) that are mainly concerned about development and diversification the local Islamic banking sector. 60% of top 10 world SWFs is concentrated in Islamic financial markets. Islamic retail banking is very profitable thanks to access to cheap deposits and high-margin financing activities. It has a significant upside given strong demographics and rising product penetration. Those institutions that would be able to develop differentiated but non-discriminating product line improve service and sales efficiency and adapt marketing and customer proposition to Sharia laws definitely succeed in the industry.